Deeds are sold at the architects for 20,000 gold. To place a guildstone, simply double click on the deed and it will be placed at your feet. You will be prompted for a guild name. This name must be a unique guild name on the shard (even if it is unique by only one space or character). The guildstone will appear where you stand and will have the name you typed in (this name can be changed later, in case you made a typing error). The stone will appear where you are standing, so be sure to stand where you want the stone to remain. Once placed, it cannot be moved again for a week. The first person to Double-Click on the stone will become the guildmaster. Double-Clicking on the stone after it has been placed and named will give you a message telling you that you cannot use the stone. In order to access the stone, you must ask for membership. Only after you have become an accepted candidate to the guild may you access the functions of the guildstone. Recruit - lets you sponsor someone for membership. Sponsored people can not be in any other guild. Sponsored people must be beside you when you sponsor them. Only 10 candidates will be allowed on the list at any one time. View Roster - lets you see the current members, 10 to a page. View Charter - lets you see the guild's description and also go to the website (if any). Both of these must be entered by the guildmaster. Declare Fealty - lets you set who you are loyal to. The person with the most people loyal to him or her (directly or indirectly) is automatically the (new) leader of the guild. There can only be 1 (one) guildmaster at a time. Toggle Abbreviation - toggles whether or not other people see the guild abbreviation above your name when they look at you. If there is no guild abbreviation, they see "None". Resign - removes you from the guild. If resigning would leave the guild with no members, the guildstone vanishes and the guild is disbanded. If the guildmaster resigns, then the one with the most followers (who have declared fealty to him/her) will become the new guildmaster. If the stone says there is no guildmaster then the remaining members can choose a new guildmaster by declaring fealty to the new guildmaster. The new guildmaster must already be a member of the guild. If you are unable to access the guildstone and you want to resign you can also accomplish this by saying 'I resign from my guild'. View candidates - lets you see the list of people that are currently sponsored to the guild. 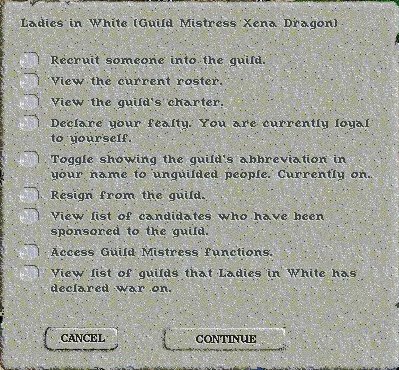 View war list - list of guilds that your guild has declared war on, and those guilds which have declared war on you. Set guild name (40 chars max) - lets you change the guild name. This name must be a unique guild name on the shard. Set guild abbreviation (3 chars max) - lets you change the guild abbreviation. This must be a unique guild abbreviation on the shard. Once the abbreviation has been set or changed you must wait one week before you can change it again. 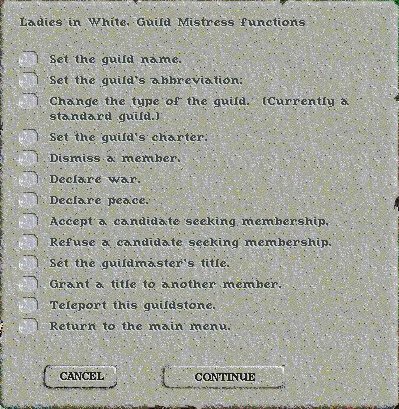 Set guild charter - lets you enter a small amount of text for the guild's charter statement (50 chars max), and also enter a website URL (50 chars max). Dismiss member - lets you remove a current member. Declare peace - ends war with another guild(s). Accept candidate - moves someone from the candidates list to the accepted list. Refuse candidate - removes someone from the candidates list. Set guildmaster title - lets you change it from "Guildmaster" to something else (20 chars max). It will be reflected on all menus and in any messages that include the title. Grant title - will let you bestow a title upon another guild member (20 chars max). Changes in guild name or abbreviation, membership standing, leader-granted title, or guilds being disbanded will notify all online members, and offline members will be notified when they log in (currently inactive because it evoked the Lag God/monster). Name changes and disbandings will also notify all online guilded players regardless of guild (currently inactive because it evoked the Lag God/monster). After selecting any option, click the [CONTINUE] button. The [CANCEL] button will exit you from the guildstone menu at any time. It is important to note that a change of the guild master in a guild with more than 25 members will not take effect until the next day. This means the guild master will not have his powers until the day after he is assigned.